I moved into a new place (4 bedrooms) - yeah I know... It’s nice to live with space. A mate, who I have known for almost 10 years through work, came to help. 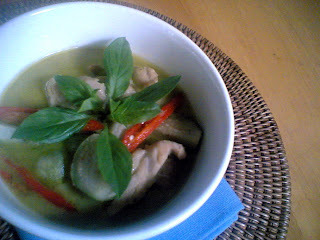 So, I manage to cook "Green Chicken Curry" for her as it’s her most favourite dish. Find below my recipe of "Green Chicken Curry"
- In a big saucepan, bring coconut milk to the boil, and cover over high heat for about 10 minutes or until bubbles, or till it begins to crack on the surface of the coconut milk. - Add curry paste and stir to break the paste. - Cook over medium heat for 3 minutes, or until fragrant. - Add chicken and stir fry for another 5 minutes. - Pour in Chicken Stock and bring to boil. - Add in fish sauce, and brown sugar to your taste. 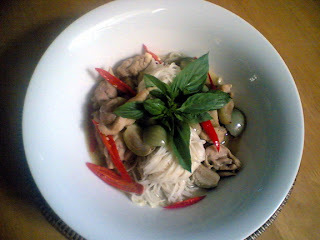 - Serve immediately with "Kanom Jeen" Fresh Rice Noodle or steamed whole-grain rice.